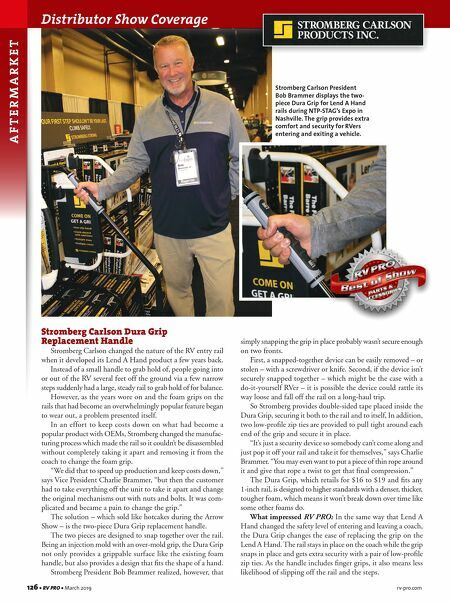 126 • RV PRO • March 2019 rv-pro.com Distributor Show Coverage A F T E R M A R K E T Stromberg Carlson Dura Grip Replacement Handle Stromberg Carlson changed the nature of the RV entry rail when it developed its Lend A Hand product a few years back. Instead of a small handle to grab hold of, people going into or out of the RV several feet off the ground via a few narrow steps suddenly had a large, steady rail to grab hold of for balance. However, as the years wore on and the foam grips on the rails that had become an overwhelmingly popular feature began to wear out, a problem presented itself. In an effort to keep costs down on what had become a popular product with OEMs, Stromberg changed the manufac- turing process which made the rail so it couldn't be disassembled without completely taking it apart and removing it from the coach to change the foam grip. 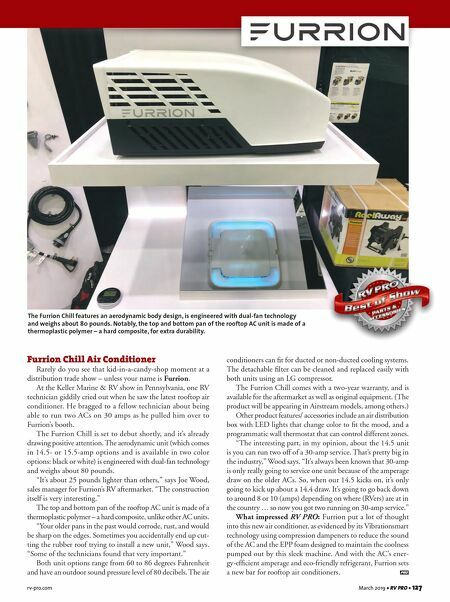 "We did that to speed up production and keep costs down," says Vice President Charlie Brammer, "but then the customer had to take everything off the unit to take it apart and change the original mechanisms out with nuts and bolts. It was com- plicated and became a pain to change the grip." The solution – which sold like hotcakes during the Arrow Show – is the two-piece Dura Grip replacement handle. The two pieces are designed to snap together over the rail. Being an injection mold with an over-mold grip, the Dura Grip not only provides a grippable surface like the existing foam handle, but also provides a design that fits the shape of a hand. Stromberg President Bob Brammer realized, however, that simply snapping the grip in place probably wasn't secure enough on two fronts. First, a snapped-together device can be easily removed – or stolen – with a screwdriver or knife. Second, if the device isn't securely snapped together – which might be the case with a do-it-yourself RVer – it is possible the device could rattle its way loose and fall off the rail on a long-haul trip. So Stromberg provides double-sided tape placed inside the Dura Grip, securing it both to the rail and to itself, In addition, two low-profile zip ties are provided to pull tight around each end of the grip and secure it in place. "It's just a security device so somebody can't come along and just pop it off your rail and take it for themselves," says Charlie Brammer. "You may even want to put a piece of thin rope around it and give that rope a twist to get that final compression." The Dura Grip, which retails for $16 to $19 and fits any 1-inch rail, is designed to higher standards with a denser, thicker, tougher foam, which means it won't break down over time like some other foams do. What impressed RV PRO: In the same way that Lend A Hand changed the safety level of entering and leaving a coach, the Dura Grip changes the ease of replacing the grip on the Lend A Hand. The rail stays in place on the coach while the grip snaps in place and gets extra security with a pair of low-profile zip ties. As the handle includes finger grips, it also means less likelihood of slipping off the rail and the steps. Stromberg Carlson President Bob Brammer displays the two- piece Dura Grip for Lend A Hand rails during NTP-STAG's Expo in Nashville. The grip provides extra comfort and security for RVers entering and exiting a vehicle.